Disclaimer! Changing your oil can be dangerous! You will lift a heavy vehicle off the ground and be under it. Please observe all precautions when changing your oil. I am not liable for any injuries received from people misusing the information contained in this post. A filter wrench is the correct tool for removing an oil filter. Install new filter ¼-½ turn after tight, by hand. A drain pan with a spout is much cleaner than an open drain pan. It’s best to have a friend who’s knowledgeable about cars help you the first time you attempt to change your oil if you never have before. Don’t ruin your car! If you are unsure, ask. Emails can be sent to hooglandaxel@gmail.com or the comment section below. The oil change is one of the best ways to get to know your car. It is also one of the easiest ways to work on your car and feel like you’ve really accomplished something. Like any work, I find it easiest to handle the oil change in two stages. You will need a good list of things to change your car’s oil. Some are nice and some are necessary. Oil is necessary, ramps are nice but not necessary. First you will need to get your vehicle in the air. I have been making due with using my wheel changing scissor jack and jack stands. This is a much more difficult and time consuming way to do this. The nicest way, in your parking lot, is to use ramps. They are fast and relatively inexpensive. If you do use a jack the safest way to secure the car in the air is to put another set of tires under the car’s front tires. It’s nearly impossible for the car to fall off a tire. If you don’t have tires, jack stands are also very good. You should also have your park brake on, the vehicle in park and a block behind your rear tires, all to prevent the vehicle rolling away. Safety First! Now you are ready to drain the oil . 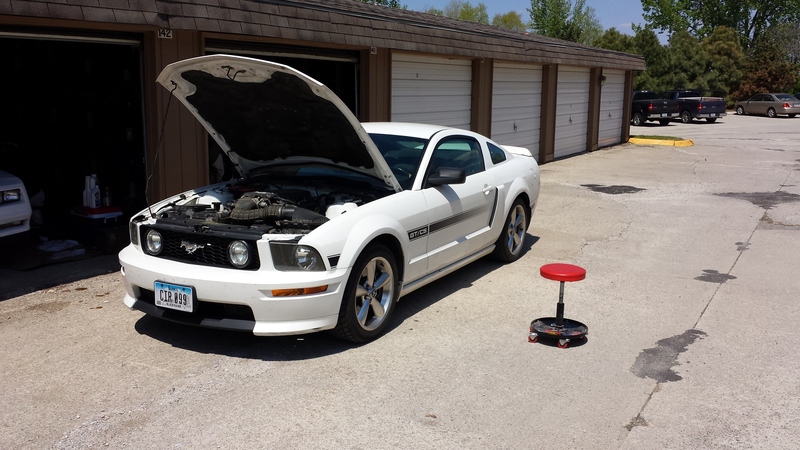 Make sure to have an oil drain pan under the drain plug and offset in the direction that the oil will shoot out. Here is a good place to mention the benefits of a drain pan that is enclosed and has a spout to help you pour out the oil. This is a great benefit over a simple open pan. When pouring from these pans you will, without a doubt, get oil all over the ground, your feet, and whatever you are pouring into. To Loosen the drain plug, first make sure you have the correct size socket/wrench. Turn counterclockwise to loosen the nut. Turn it a few turns and then it will be best to finish removing it by hand. You will want to turn the plug counterclockwise but keep pushing it into the pan, sealing as much oil in as you can until it is completely unthreaded. Once the plug is completely unthreaded, pull it away fast and get as little oil on your hand as possible, this is quite the feat. Next you will want to remove the oil filter. There are 2 main types of filters. Historically most vehicles used external filters, and these are still very common. More recently there are cartridge filters. These are often easier to change and less messy. For external filters, there are multiple wrong ways to go about removing this part. It is possible to use a large channel locks to grab the filter. You can also stab a screwdriver through the filter and turn using that. Both of these methods will ultimately cause you more trouble than good. You will likely puncture the filter and make a big mess with oil everywhere and expose yourself to sharp surfaces on the filter. 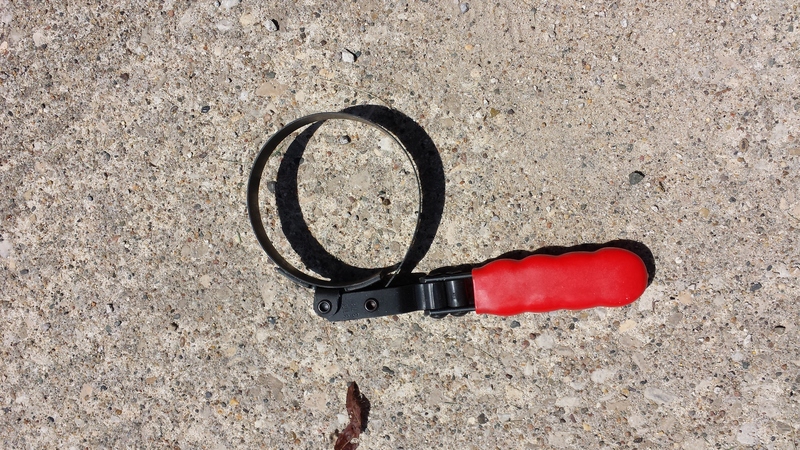 The correct way to remove the filter is using a filter wrench. Some filters have a large socket built into the bottom of the filter. These can be good, but personally I have always had good luck with the strap style filter wrench. Filters also come in different sizes, so when buying a filter wrench make sure it fits your filter! 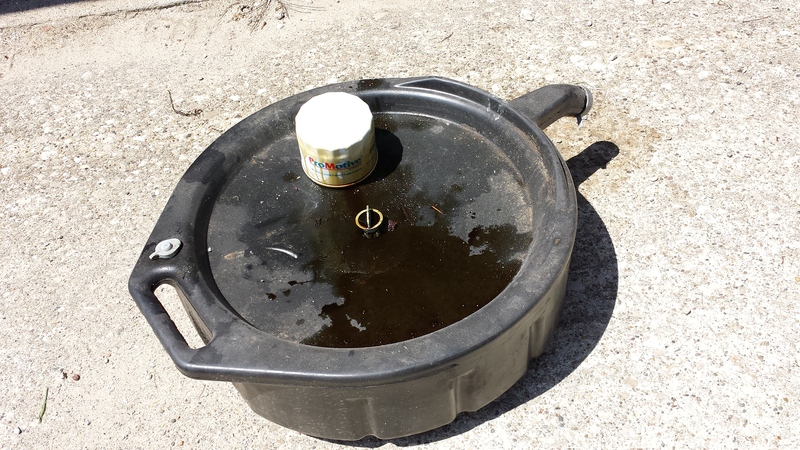 Make sure you have a drain pan under the oil filter to catch oil. You will want to turn the filter a few times counter clock wise to get it loose. Then, like the drain plug, spin until loose while pushing up and once it is loose control the filters fall to the drain pan. Now to install the new filter. First you will want to let all the oil drain out. I like to wipe off the seating surface on the engine block with a clean rag. You will want to smear some of the new oil on the sealing ring (on the filter) to ensure a good seal. Then spin the filter back on until snug, then turn between ¼ and ½ a turn, by hand. This is all the tighter the filter needs to be reinstalled. It should be snug but not so tight it is squeezing the seal out, creating a leak. This is one area where changing your own oil is good. Often a shop will over tighten the filter to where it’s nearly impossible to remove! This is to cover themselves as it’s better, for them,if it doesn’t come off than if it falls off. Same goes for the drain pan plug for that matter. By now all of the oil should have drained out of your car. You can remove the oil and put the drain pan plug back in. Make sure to wipe all the oil off the pan. Start threading the plug back in BY HAND. In fact this is a good place to mention that all nut/bolts should always be started by hand and tightened as much as possible this way to avoid cross threading. There should be a torque spec for the pan plug. Often to snug and then ¼ to ½ is good. As you work on your car more you will definitely develop a feel for tightening nuts eventually and for most general nuts/bolts you should develop a “calibrated” hand so you shouldn’t need a torque wrench unless it’s an important vehicle part, like a head on the engine. 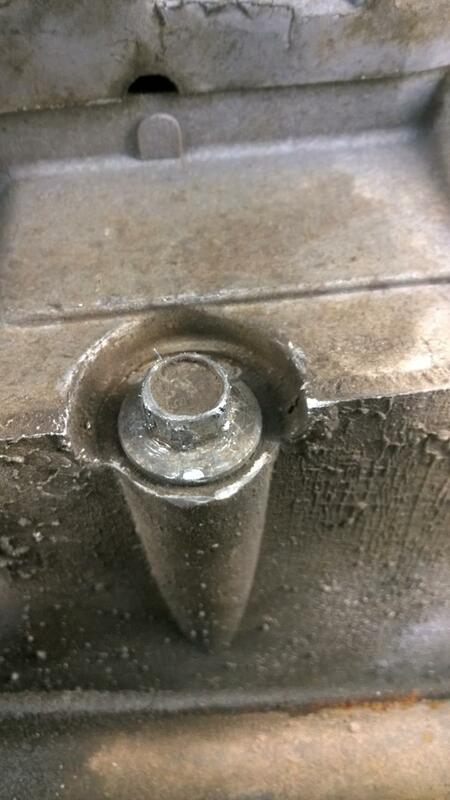 You definitely don’t want to over tighten this bolt as you will strip the thread which will lead to an oil pan change. If you are at a level where you are tempted to tighten the pan plug til you are stripping the threads, you probably aren’t ready to perform an oil pan replacement. It’s probably best to practice tightening a bolt in a nut held in in a vise if you have never tightened a bolt in your life. After you have put the filter and plug back in you are ready to fill the vehicle with nice new oil. 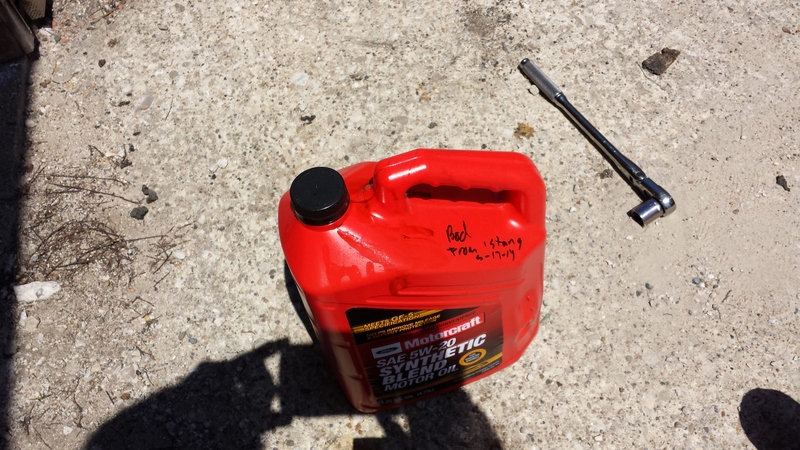 I always use a small funnel to direct the oil back into the engine and not get it all over the engine! Refer to your owners manual for the right amount of oil for your vehicle. After you have filled it and looked that there are no leaks I prefer to put the car back on the ground. I then start the car and let it run a minute or two. This gets the oil filter filled and the oil level correct. Let the vehicle sit a few minutes while you clean up. You can then check the oil level. An important thing to do after changing your oil is to make a log of when you changed it so you know when to change it again, this gets especially important when you have multiple vehicles. I personally use duct tape and a magic marker and place it over the old reminder. I also like to put the date on so I remember that. I prefer to mark the mileage when I changed the oil, as opposed to most stops put when the next change is due. I tend to go over the recommended 3,000 miles (for older cars). Some new cars can go to 15,000+. I prefer to know how many miles I have on the oil as opposed to when it “should” be changed. They intervals are different for every vehicle and engine so do your homework, check your owners manual, ask your friends, or ask me in the comments below. I personally keep an excel document of all the work I do to each vehicle (since I have 6 vehicles), each gets it’s own page. Mileage done at, date, and maintence done. I find this the best way to know what needs to be done next. Lastly you will need to dispose of your old oil. Remember the drain pan with a spout? This is where it will help you in putting the old oil back into the quart/5 quart bottles the new oil came in. Once you have poured the old oil in, make sure to mark the bottle on the top “Bad/used oil”. You will not likely be returning it that day to the disposal place. It may sound impossible that someone would mistake this old oil for good new oil, but stranger things have definitely happened! Better safe than sorry. Lastly you will need to dispose of your old oil and filter. Usually you should be able to return that to any place that sells oil free of charge. 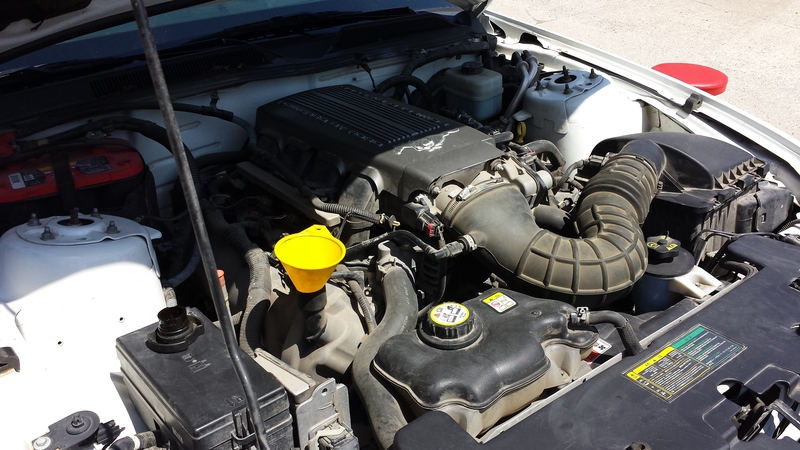 Hopefully this post has gotten you excited about working on your car. In the future I will investigate some more exciting work. But I think changing your oil is a definitely a good place to start for those who haven’t gotten their hands too dirty yet.